Sometimes your phone's built-in to-do list isn't enough. Plenty of people still rely on pen and paper, but it's inarguable that smartphones have become the more common way to keep tabs on what needs to get done. And while Apple and Google both offer basic reminder apps, many people might crave something a little more robust. Fortunately, both app stores are teeming with task management apps, so much so that picking the right one can be overwhelming. 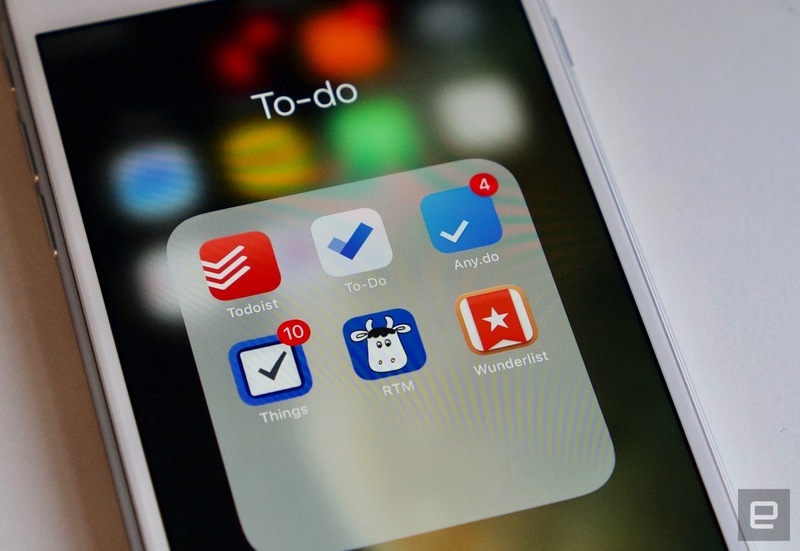 As a chronically disorganized human, I've found that to-do apps are key to my productivity. As such, I periodically reevaluate what I use and check to see how the various big-name options have evolved. Eventually, in my quest to find the best task management service for most people, I settled on five options: Todoist, Remember the Milk, Things, Wunderlist and Any.do. There are a host of factors that go into evaluating these services, but they include pricing, design, ease of use, cross-platform support and "power" features. This last category encompasses things like natural language support, voice commands, attaching notes or files, sharing tasks or projects with co-workers or family members, and integration with other services, to name just a few examples. While all the apps I tried would work well for most users, it didn't take long for me to conclude that Remember the Milk and Any.do aren't the absolute best options. Points in favor of RTM included solid platform support: It has apps for iOS, Android and the Apple Watch, as well as a web interface for when you don't want to use mobile. It also has detailed reminder integration, with options to ping you via email, text, Twitter or push notifications. You can connect RTM to many third-party services, too, including Gmail, Google Calendar, Siri, IFTTT and Alexa. The main knock against RTM is its price. The "pro" subscription costs $39.99 a year and adds subtasks, unlimited task sharing with others, colored tags, Apple Watch access and mobile reminders. Ultimately, restricting important features like mobile reminders and subtasks to a pricey subscription makes it tough to recommend. It also doesn't help that RTM's web app feels both dated and a little arcane. The mobile app is lovely, though -- if you're a phone-first user who doesn't care so much about reminders and subtasks, the free version of RTM is worth checking out. Remember the Milk's web interface. 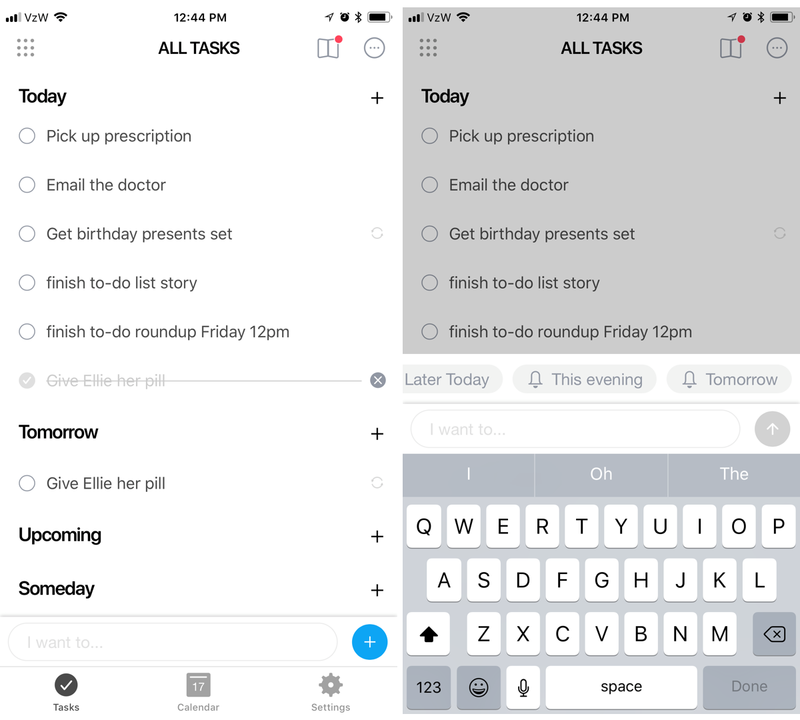 Any.do stands out mostly for its unique take on task management. For better and worse, it doesn't display tasks the way other apps do. Rather than use different lists as the main way to organize your life ("home," "work" and so on), Any.do defaults to showing what you need to get done today, tomorrow, further out (the next week, say) and "someday." Naturally, you can put items into different lists as well, but the main interface is designed around managing what you said you wanted to get done today, regardless of whether it's a personal item or something from your work list. To that end, Any.do works well alongside your calendar, to which you can allow access when you set up the app. It'll then show your appointments and to-do items side by side. And for those of us who never manage to check everything off, there's a feature called the "Any.do Moment" that gives you a rundown of your day and lets you reassign tasks to different days depending on what you have the bandwidth for. 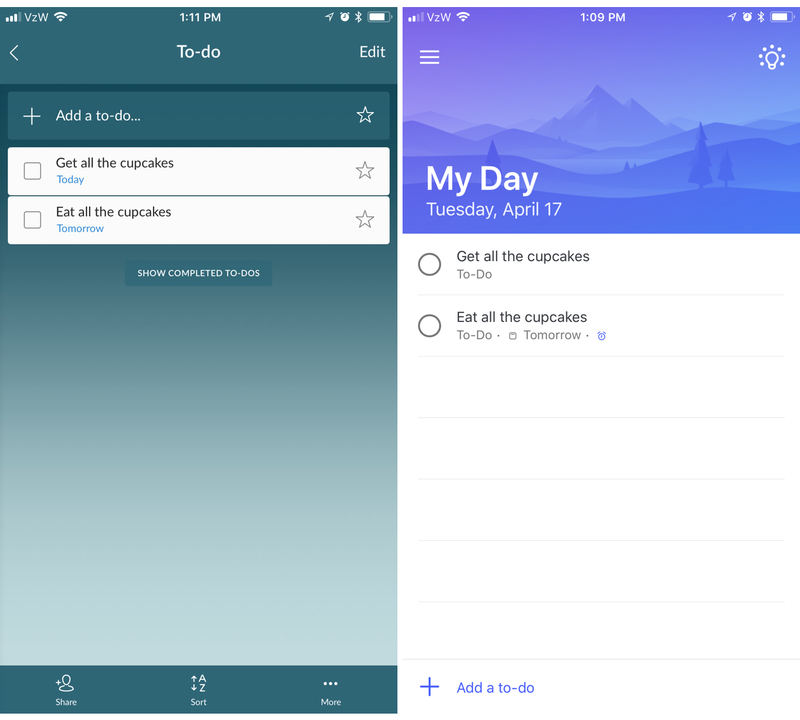 Any.do's main app interface (left) and adding a task (right). Another nice feature is its auto-completing suggestions that pop up when you make a new task. Items like "call," "buy," "clean," "email" and more show up for you to tap on; when tapping "call," you can start to fill in a name and it'll then suggest contacts from your list. Google does something similar when you create calendar entries on mobile, and it does make it easy to fill out many common chores. If you've found that "standard" to-do apps don't work well for you and you want to try a more proactive organizer, Any.do might fit the bill. The free version is fairly generous with features, though you'll need to upgrade for location-based reminders, unlimited Any.do Moments (it's not clear how it restricts them in the free version), customized recurring tasks and unlimited size attachments. Any.do's plans range from $32 a year for a single device to $35 a year for unlimited devices. There's also a low-risk $4-per-month plan if you want to give it a shot before committing. However, it's worth noting that if you subscribe to the other apps on this list, you're going to spend around $30 per year. Developer Cultured Code has been supporting Things for years, so while that up-front cost is significant, you hopefully won't have to think about it again for a long time. If you can get past these caveats, you'll find an extremely powerful but streamlined task management app. From a pure design standpoint, Things is delightful. The typeface is large and easy to read, without taking up too much space. Tasteful animations abound without distracting you from your tasks. Subtle visual clues let you see how far you've gotten through a larger project. The whole thing feels polished, and is just a lot of fun to use. Things (the Mac version is above) offers a ton of organizational flexibility. Despite Things' simple design, there's a lot of organization options under the hood. At a high level, your "areas" can hold basic to-do items, but you can also add sub-areas, called projects, which you can use to group to-dos under a single header. 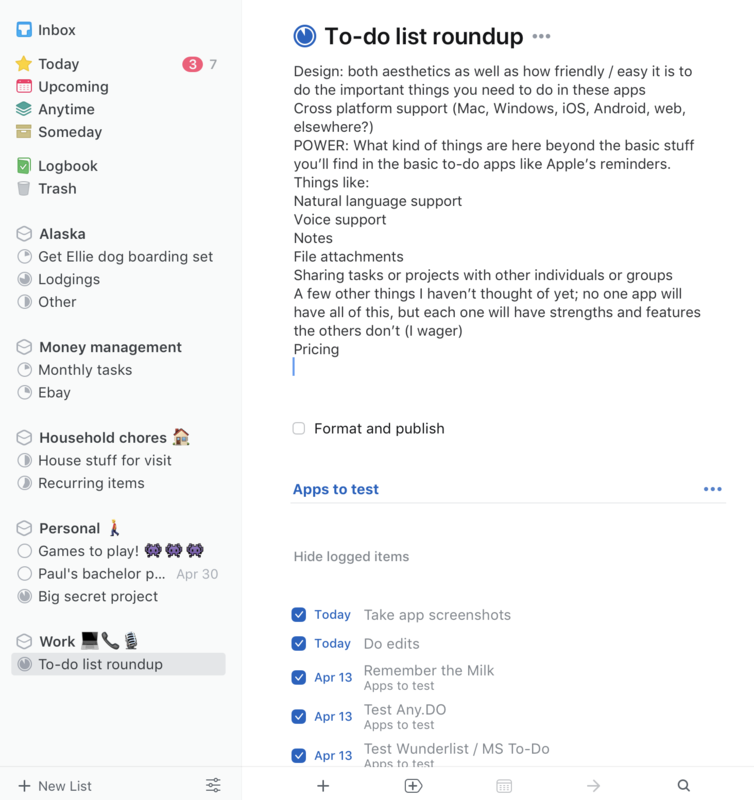 For example, I have a "work" area that has simple to-dos (like "finish expenses") as well as bigger projects with multiple steps (like this to-do app review roundup, which had multiple items below it). Projects and to-do items can hold extensive notes, as well as have due dates and reminder dates. To-dos can also have subtasks assigned. If you're the kind of person who prefers to break down tasks into small steps, Things is well suited to the job. Unfortunately, there are a handful of features missing here that you'd expect to see in an app this expensive. Adding due dates and reminders is easy enough through a little calendar interface, but you can't use natural language. Typing "Send weekly team email every Friday" or "Order groceries tomorrow at 3pm" doesn't do anything by default. On the Mac, you can click the calendar item and then type in "this Friday" or "the 20th" and it'll add a due date, but you can't do that on the iOS apps. Things also doesn't support location-based reminders, file attachments or collaboration of any kind. If you're a heavy Apple user, can stomach the price and don't mind the missing features (I personally can live without collaboration tools and location reminders), Things has much to offer. But given the price and exclusive focus on Apple devices, many people will do better elsewhere. I wasn't surprised that my search narrowed to Todoist and Wunderlist -- they often show up on best-of lists like this. Both work on just about every device -- in addition to the standard iOS and Android apps are Chrome extensions and apps, Windows 10 and Mac apps for Todoist, good Apple Watch support for both... the list goes on. There's even a Todoist Safari extension! Neither app is quite as granular as Things, but you can still lay out projects with to-do items nested below; each of those items can have subtasks as well. Before going too deep into each app, however, it's important to note one big caveat for Wunderlist: It was bought by Microsoft in 2015, and the company has confirmed that Wunderlist will eventually be replaced by a new app. That app, simply called To-Do, has been out in an open beta for a year now, so naturally I gave it a shot. It does much of what Wunderlist can do, but it lacks Wunderlist's natural language input for adding due dates. There also aren't any collaborative features, at least not yet. The good news is that Wunderlist's former "pro" features were all unlocked just a few weeks ago, so you can get the full experience without paying. Wunderlist on the left, To-Do on the right. Due to the uncertainty surrounding Wunderlist and To-Do's currently missing features, Todoist feels easier to recommend. At $28.99 for an annual subscription, it's one of the more affordable options, and with that you get a raft of features. (The free version omits some tools, but it's worth trying it to see how it works before subscribing.) Its organizational system can be as simple or as complex as you want -- projects hold to-do items, which in turn can have as many subtasks as you want to add. And you can make a folder of projects to add another layer to your organization system, if you're so inclined. 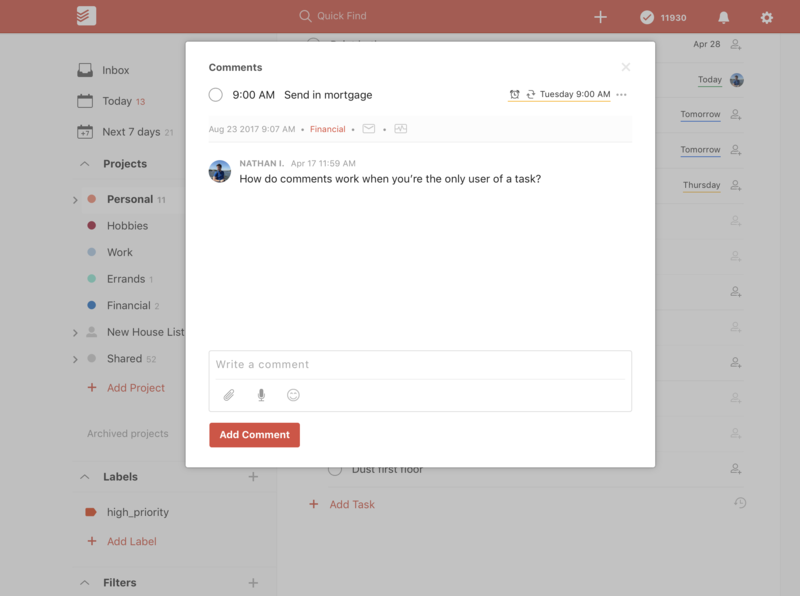 Todoist's task interface and comments section. Todoist also has natural language support, so you can have tasks pop up "every 11th" or "Friday at 2PM," and it's easy to collaborate on projects with other Todoist users. The app also includes location-based reminders. Unfortunately, it doesn't know things like your home or work address by default, but it's still easy to locate places and get reminded when you leave or arrive. For the times when you can't get everything done by a due date, Todoist features a "smart schedule" that looks at your upcoming tasks and figures out where to slot in things you've missed. Of course, you can just reschedule things yourself, but Smart Schedule makes it easy to clear out overdue items fast so you can get on with your day. Todoist also lets you attach files and add comments; those comments can work as a notes section as well as a way to get the attention of others shared on a particular task. The bottom line is that every time I thought of a feature I might want in a to-do app, a little digging showed that it was available in Todoist. The app is reliable, receives frequent updates, is available on any platform you choose and is easy to use while still offering flexibility and power. It might not have the slickest design among to-do apps, but it is the most practical option for most people.